14 The Middle Pigeons for trombone, tuba, and recorded sound McComas, Inez S.
Throughout history women composers and performers have struggled for recognition of their works. The mid-to-late 20th century represents the first period when women were recognized as having potential as performers and composers. Similarly, the tuba has been an instrument predominately played by men, with women performers not accepted as equally capable until approximately the last 40 years. As a woman tuba player I am excited to showcase talented 20th century women composers through the recording of a CD of selected works for the tuba that have not yet been recorded. 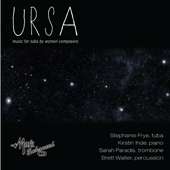 Through the commissioning of two new works, by Asha Srinivasan and Inez S. McComas, I am thrilled to bring new compositions into the relatively small catalogue of music for the tuba by women composers.